Smartphones and tablet computers are becoming essential in everyday life, connecting us in a powerful network through mobile web services. They open new channels of communication between citizens, institutions and administrations, offer greater access to public information, and facilitate increased participation. These new forms of collaborative social interaction revolutionize our information and knowledge society. The chapter examines the new opportunities opened up by mobile phones for mParticipation in the context of urban planning processes. After beginning with a theoretical overview about technical developments, eParticipation and the changes in communication in a networked society, it defines the concept of mParticipation. This is followed by an examination of six real-world projects. These examples are then used for the identification of best practices and for the analysis of the usefulness and effectiveness of these new participatory tools. In addition, the chapter discusses the possibilities as well as the barriers to mobile participation, and makes recommendations for the use of smartphones in urban planning. mParticipation opens new channels of communication, creates new ways of gathering local information and has the chance for creating a low-threshold gateway for citizen participation in urban planning, by improving databases and giving instant feedback. Nowadays, people listen to music on-the-go (first with Sony’s Walkman, than mobile cd-players, later on the iPod and now on the smartphone), and instead of a desktop PC at home, they take laptops or tablet computers, which are connected to the internet, with them. More and more people use smartphones for communication (phone calls, email, and social networks), leisure (music, games), information (news on web) or financial transactions (banking), etc. They get information and access services at any time, irrespective of location; only limited by infrastructural access to the mobile Internet. Banks (2008) states that mobile phones “allow citizens to engage more actively in civil society by monitoring elections and helping keep governments accountable,” especially in the case of smartphones. Mobile technology is getting smaller, lighter, cheaper, more powerful, and ultimately, smarter. 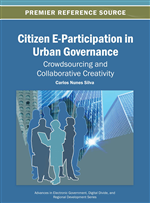 This chapter is focused on mobile participation (mParticipation) and on the possibilities for citizen engagement in urban planning through the use of smartphones. Smartphones and tablet computers are becoming essential tools in our everyday life, connecting us in a powerful network through mobile web services. They open new channels of communication between citizens, institutions and administrations, offer greater access to public information and increase citizen participation in urban governance. These new forms of collaborative social interaction revolutionize our information and knowledge society and will shape the patterns of our future social life. The chapter is focused on the latest research, new concepts and innovative projects, which are best-practice-examples for the future. The chapter doesn’t focus on other important aspects: e.g. SMS-based mParticipation for empowerment and citizen engagement in third-world-countries (e.g., in African countries), where these kinds of mParticipation and ePayment via mobile phones rose in the last years (UNDP, 2012; Hellström, Karefelt, 2011; Banks, 2008; Commonwealth of Learning, 2011); neither on new forms of mobile phone based electronic payment in African countries (Streich, 2011). Concerning urban planning, smartphones add new values to traditional methodologies and concepts. Facilitating in-situ-data collection and enabling networked cooperation they pave the way for crowdsourcing processes (see Erickson, 2010; Zeile et al., 2012). In addition to traditional media, a variety of new heterogeneous stakeholders take part in the creation and transmission of political and planning issues.